Sport Court South Florida has been in the industry of providing customers with sports courts for quite a while now, with many big name NBA coaches and players as part of our clientele. Having installed over 50, 000 courts worldwide, we can safely say that we’re something of an expert in the business. With our commitment to top quality and drive to offer our customers with numerous options to meet their court and sporting needs, we’re certainly a top choice for those looking to design and install sport courts. 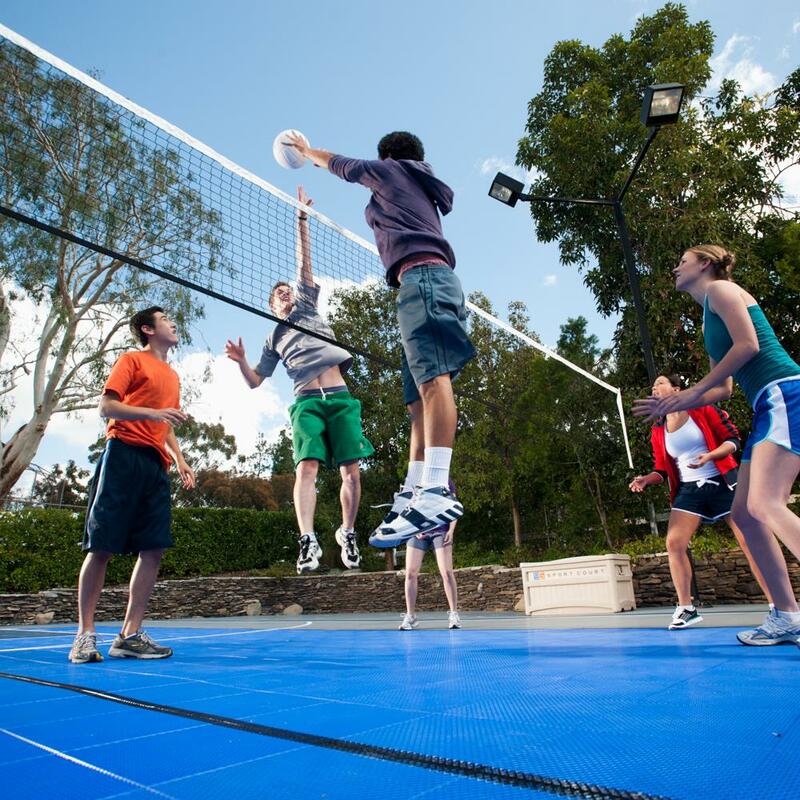 We offer a number of different products to our clients, which cover quite the varied range of sport court facilities and accessories. Our outdoor surfaces include PowerGame™, Sport Base™, Sport Deck™, and Sport Game™. While PowerGameTM is one of the safest basketball courts in the world, SportGameTM is a surface type ideal for multiple sports, with SportBaseTM also serving as a multi-sport play court. SportDeckTM is for all your racquet sport playing needs, with an extended life compared to most acrylic courts. When it comes to indoor surfaces, we provide a range of different surface options, including Response HG: Maple Select™, Response HR™, Response™, and Defense™. All our indoor court surface products offer durability, longevity, and superior performance potential for athletes. When it comes to accessories, we offer Hoops & Lights™, a professional quality hoop system that offers enhanced safety and better performance. Multi-Purpose Net Systems are for the purposes of raising and lowering the nets for games such as volleyball and tennis, offering a quick way to get the job done. We also provide Fun Packs, which offer a collection of premium quality sporting gear, ranging from basketballs to tennis racquets. Additionally, Ball Containment and Rebounders are also available at Sport Court South Florida, serving to keep the court protected and ensure the balls stay on court where they’re meant to be. We provide long-lasting, durable tennis courts that call for fairly minimal maintenance. There is the option of having us custom build a tennis court for your own home or for official tennis facilities. Want to get a putting green installed in your very own backyard? That’s all possible with Sport Court South Florida. We provide putting greens for both residential and commercial purposes, a product that calls for little to no upkeep, and the thickest and most firm turf for enhanced play. When you think of South Florida, you’re bound to think of sprawling, sparkling beaches too. What’s better than a game of beach volleyball? We provide custom beach volleyball courts for your home, bringing the fun of beach volleyball to your own home! Get a little more activity into your daily routine and feel yourself flourish—in more ways than one. Interested in designing your own basketball court or investing in a backyard volleyball court? Get in touch with us at 1-800-313-2944 and we can get you a free estimate before getting started on your project!